Bournemouth University and Baringa selected to deliver data analysis and algorithm development to the Energy Technologies Institute (ETI). The High Frequency Appliance Disaggregation Analysis project will analyse real world data from the ETI’s Home Energy Management System (HEMS) in five homes to gather detailed energy data from water, gas and electricity use. This data will help develop algorithms to forecast domestic energy needs of the future and provide industry with valuable insight into consumer energy use to develop efficient energy services. 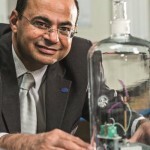 Bournemouth University, under the lead on Professor Hamid Bouchachia, and specialist energy advisors Baringa Partners have both been selected by the Energy Technologies Institute (ETI) to undertake data analysis in a new knowledge building smart energy project that will investigate domestic energy use. The High Frequency Appliance Disaggregation Analysis (HFADA) project builds upon work undertaken in the Smart Systems and Heat (SSH) programme delivered by the Energy Systems Catapult for the ETI, to refine intelligence and gain detailed smart home energy data. The project will analyse in depth data from five homes that have been trialling the SSH programme’s Home Energy Management System (HEMS) to identify which appliances are present within a building and when they are in operation. The main goal of the HFADA project is to detect human behaviour patterns in order to forecast the home energy needs of people in the future. In particular the project will deliver a detailed set of data mining algorithms top help identify patterns of building occupancy and energy use within domestic homes from water, gas and electricity data. Bournemouth University and Baringa, working in partnership with ASI Data Science, will work independently to provide information derived from the water, gas and electricity use in these UK homes, from the end of 2017 to middle of 2018. Should anyone be interested in further details, please contact Prof Hamid Bouchachia at abouchachia@bournemouth.ac.uk.